THERE are likely to be severe delays on all roads in the southeast, for the next three months, as Duke William continues his invasion of England. The official advice is to postpone your travel arrangements unless it is absolutely necessary as all travel is likely to prove dangerous to your well-being. The news from Duke William’s advisers is that he expected the homage of the English Witan but this submission has not arrived, and that piques – one in the Norman eye for William. 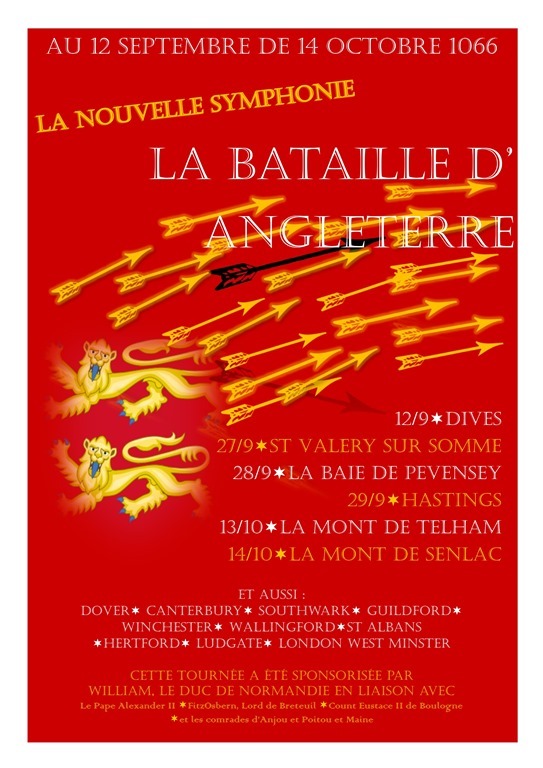 The First Division will form the main Norman Army and march first north to Senlac Hill and then will follow the ancient trackways and Roman roads east towards Dover before moving on to Canterbury. It is a circuitous route as it must avoid the Appledore Estuary, that great inland sea that stretches almost all the way to Tenterden. The objective is to secure Dover and start the building of a Castle before moving off towards Canterbury. I have it on good authority that it is the Duke’s intention to negotiate the surrender of Canterbury, safeguarding the Cathedral where he intends to pray for redemption and the blessing of the remainder of the campaign. and Chichester, survey and list sites for fortification that will secure Duke William’s control of Wessex that was once the stronghold of Harold Godwinson. Barons such as William de Warenne also see it as an opportunity for personal gain, identifying lands that that they will petition the Duke for once he becomes King. With the prospect of rich pickings further west they begin to look and strut like Norman invaders and are eager to leave the confines of Hastings. Once at Fareham Creek, they are to rendezvous with reinforcements sailing from France and Normandy. After a period of assimilation, the enlarged Division is to move north towards Winchester, making camp at Alresford and wait for further instruction from the Duke William himself. It is stressed very forcibly, that they must not make any move on Winchester itself. 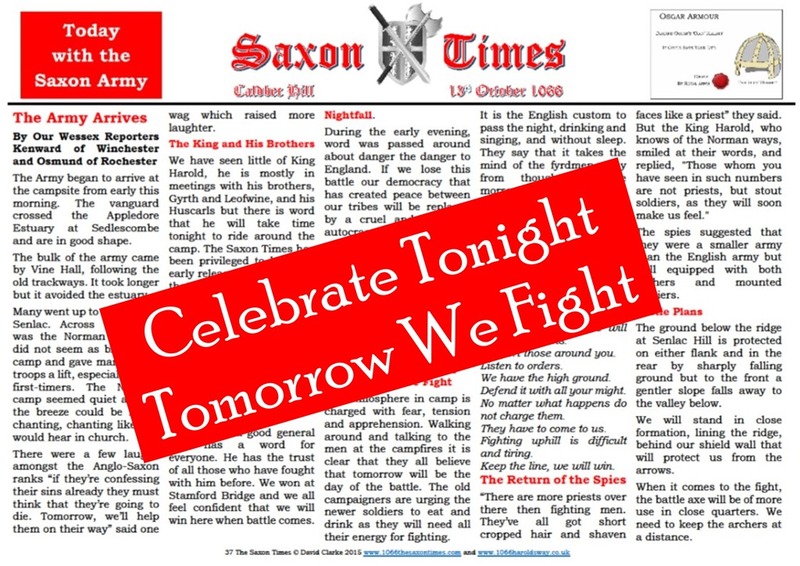 For the stories behind the headlines and the latest news on Duke William’s ‘Invasion of England’ read The Saxon Times. 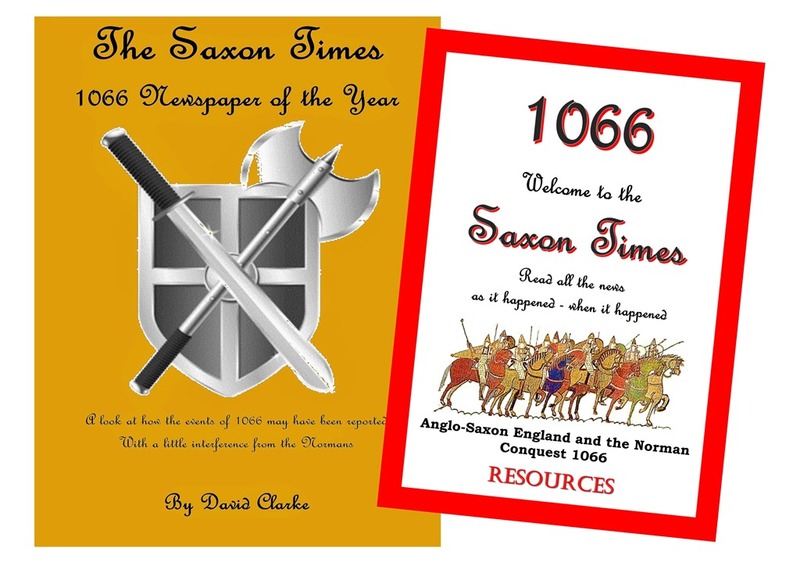 The 1066 Saxon Times Resource book is a compendium of all the leading stories of 1066 available as a downloadable and photocopiable classroom resources, including quizzes to test your knowledge, and is available from The Saxon Times and TES. 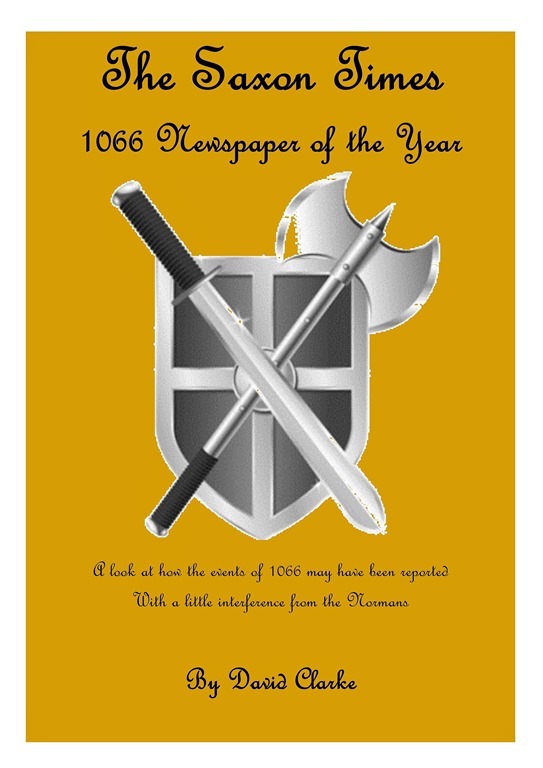 The Saxon Times brings you all you need to know about everything 1066. More than a newspaper it’s a comment on all the tumultuous events as they happen with latest news, breaking news and current news from around 1066. Get all the big headlines, analysis and opinion on the stories that matter. Now available as ‘The 1066 Saxon Times Resource Book’ with 67 downloadable classroom resources covering the whole year from the Consecration of West Minster Abbey to New Year’s Eve 1066 when Duke William can be found hiding in a nunnery in Barking! 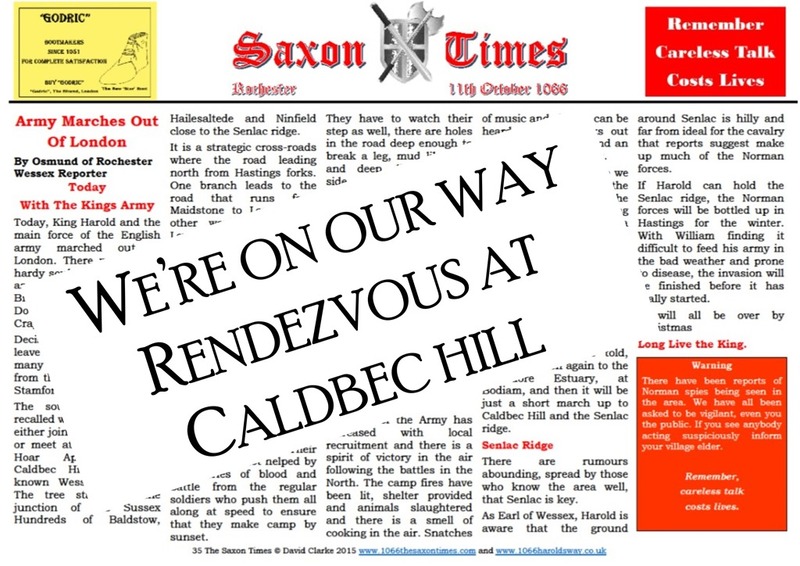 and is available from The Saxon Times and TES. William’s orders for his forces suggest that he has planned to open the battle with volleys of arrows from his archers in the front rank to weaken the Saxon army. The infantry will then engage in close combat to create openings in the Saxon lines which could be exploited by a cavalry charge. The Saxon lines would be broken and the cavalry would be free to pursue the fleeing soldiers. It was a tried a tested plan that had worked in France. It will exploit the lack of English archers and cavalry, but at Senlac they will be fighting up hill and if the English line holds firm on the ridge the outcome cannot not be forecast. Any doubt in Norman minds are assuaged by exhortations from Duke William and Bishop Odo that God and Right are on their side and that Norman discipline will prevail. The Army began to arrive at the campsite from early this morning. The vanguard crossed the Appledore Estuary at Sedlescombe and are in good shape. The bulk of the army came by Vine Hall, following the old trackways. It took longer but it avoided the estuary. It is the English custom to pass the night, drinking and singing, and without sleep. They say that it takes the mind of the fyrdmen away from thoughts of the morrow. Axes are being sharpened, leather bottles filled. There is much talk of past campaigns and victories to motivate and energise the forces, especially those who are inexperienced. Many went up to the ridge at Senlac. Across the valley was the Norman camp. It did not seem as big as our camp and gave many of the troops a lift, especially those first-timers. The Norman camp seemed quiet and on the breeze, could be heard chanting, chanting like you would hear in church. There were a few laughs amongst the Anglo-Saxon ranks “if they’re confessing their sins already they must think that they’re going to die. Tomorrow, we’ll help them on their way” said one wag which raised more laughter. There are rumours abounding, spread by those who know the area well, that Senlac is key. As Earl of Wessex, Harold is aware that the ground around Senlac is hilly and far from ideal for the cavalry that reports suggest make up much of the Norman forces. If Harold can hold the Senlac ridge, the Norman forces will be bottled up in Hastings for the winter. With William finding it difficult to feed his army in the bad weather and prone to disease, the invasion will be finished before it has really started. 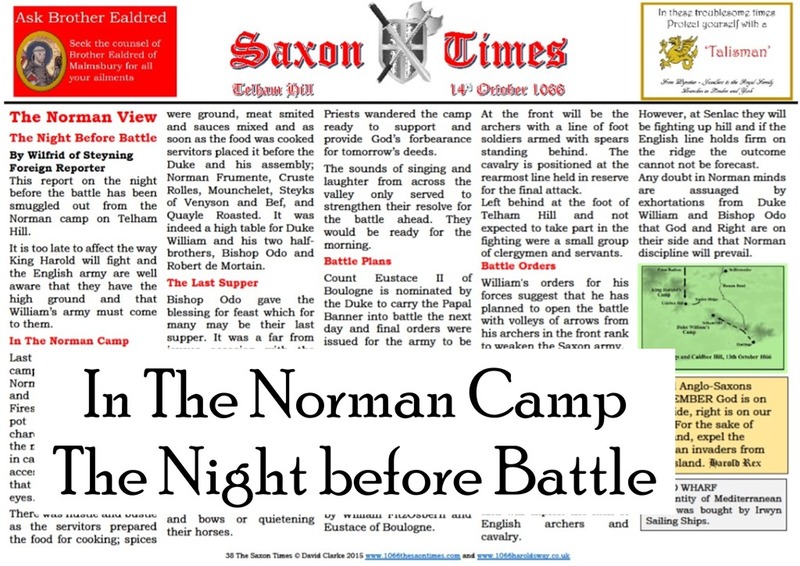 The Saxon Times looks at how the events of 1066 may have been reported by an English newspaper and takes a chronological, topical and contemporary view of the tumultuous events that surround the Norman Conquest of England as they unfolded and appeared to its readers through the ‘eye-witnesses’ reports of the Saxon Times reporters. By the time of the Norman Conquest, England had been Anglo-Saxon for 600 years but the death of King Edward the Confessor (1042–66) and the subsequent events that led to the Battle of Hastings changed England forever. When King Edward the Confessor died in January 1066 nobody could have foreseen the year of bloodshed and mayhem that would take place. Everything seemed settled and peaceful. England had developed a strong government, a prosperous economy and extensive trade links across the North Sea and the Channel. A strict social system was headed by the aristocracy with most Anglo-Saxons ‘peasant farmers’, who in return for protection from a lord, owed him service such as military service in return for land to farm. This military service had created a militia ‘the fyrd’ for defence of the realm which had finally provided some peace from Viking invasion and was one of the reasons that England had such a well-organised government. The succession crisis of 1066, following the death of King Edward the Confessor meant that once again greedy, envious foreign eyes were being cast toward England. Invasion was not far off. · What happened in 1066: the year of the Norman invasion.